As opiniões dos nossos clientes são para nós muito importantes. Gostamos que todos se sintam em casa e que nos ajudem a recebê-los cada vez melhor. Deixe-nos o seu testemunho e as suas sugestões. Muito obrigada. Ancienne ferme très bien rénovée, beaucoup de charme. Un endroit agréable et reposant. J'ai beaucoup aimé y séjourner et Héléna est très gentille et attentionnée. Un petit coin de paradis, havre de paix bien caché à deux pas de plages plaisantes et non touristiques, et de la jolie ville de Vila do Conde. Une excellente adresse. Una casa muy acogedora y decorada con mucho gusto. La cama muy comoda y el desayuno muy cuidado con bizcocho casero y zumo de naranja natural, entre otros detalles. La atencion y el servicio excelente. Un 10. Uma experiência singular! Recomendo muito. Já tínhamos estado no ano passado e temos muita vontade de lá voltar. Gostámos muito da simpatia na receção, da limpeza do espaço, da experiência de viver um dia das nossas vidas num espaço decorado à época (século XIX), mas com as comodidades modernas, com uma ligação interessantíssima entre os elementos antigos com os da atualidade. O pequeno almoço é fabuloso. Não gostámos de ter de vir embora. This place was amazing, lovely old farmhouse in the countryside north of Porto. The rooms are spotless and super well appointed and the bathroom's toiletries are excellent. Breakfast was lovely in a rustic kitchen. Everything was perfect! Good breakfast; Helena was very helpful. A lovely and tranquil place to stay, well outside of Porto but only a 15 min drive from the airport. However, the city was easy to get to, with the nearest Metro station being only a 5-10 min drive away with plenty of parking. It was then a 40 min ride (on the slow metro!) to get to the centre of Porto. Великолепное место для душевного отдыха! Великолепный гостевой дом! Чувствуешь себя как в музее. Все продумано до мелочей и реализовано с душой. Большое спасибо администратору за все рекомендации и созданную теплую атмосферу! Хочется возвращаться туда снова и снова! Рекомендую всем! We did arrive and had a VERY friendly welcoming, a SUPER nice and SUPER clean room, in the morning a LOVELY breakfast, the Master of the place, Madame Helena is FANTASTIC! - We will at anytime vote for her as President of what ever country is should be - and the country in question will have a great future!!! We do travel at lot - but this place is OUTSTANDING - and so is all of the staff and management!!! Try it your self PLEASE!!! (No, we are not family and we are not paid for writing like this......!!! Our stay is way too short , 3 - 4 weeks more here would make life even greater!!! A lovely old farmhouse well restored by Helena Duarte and her family who have owned it for generations. Well set back in its own grounds from the not-very-busy N306. 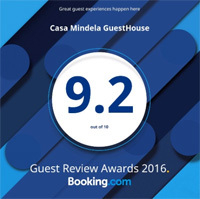 Helena has been running it as a guest house for just six months and deserves to do well. She took great trouble to organise our dinner (we are travelling on foot) and to be up very early to give us breakfast. Thank you. WONDERFUL LOCATION WITH A VERY DEDICATED HOST! The site Was wonderful. Renovation of the building was outstanding. All the staff was very kind and helpful. Really enjoyed my stay there. Everything, lovely old house, near the airport which was what we were looking for as we had a late flight in. the breakfast was lovely too, with lots of homemade cakes and jams! 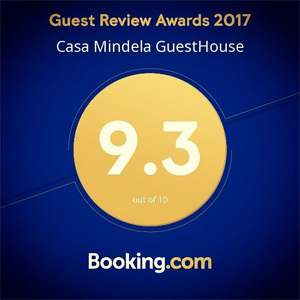 Excellent stay at Casa Mindela. Helena was a very welcoming host for my parents. The rooms were clean and comfortable. The hotel has a lot of chic and rustic charm. Breakfast was delicious too. Note this place is 20 minutes north of Porto airport, and 10 minutes away from the beach. Not an actual guesthouse, but rather a hearty portugese family opening the spacious and comfortable attic of their beautiful beach house. I was rewarded with portugese hospitality in a familiar atmosphere, not lacking anything, including amazing food. They helped with all the onwards organization for caminho portuges. My husband and I were walking the Portuguese Camino. Casa Mandela was like a oasis after a very long day of walking. Elena was very professional and Even offered to pick us up after our dinner, because we were walking, she didn’t want us to walk home in the dark. 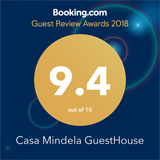 We thoroughly enjoyed our stay there and would highly recommend her guest house for any body walking the Camino or visiting the area. Our room was fabulous and because of the property's location was quiet- we slept really well. The staff was excellent Amazing family Quinta home. Super host. Wished wecould havestayedfor several days. Because no close by restaurants, host called in order, picked up and served us in her dining room, providing wine, bread with wonderful spreads. Great breakfast too! This is hands down our favorite stay of about 40 days walking. A Casa Mindela é um cantinho muito bem conservado a dois passos do Porto. A casa, apesar de antiga, está devidamente remodelada, com todas as comodidades necessárias. O pequeno almoço é simples mas completo.